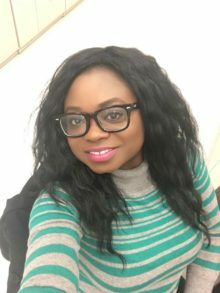 Abigail Zita Seshie is a Ghanaian-born Doctoral Student majoring in sociology at the University of Saskatchewan, Canada. She graduated with first class honours in Sociology and Theatre Arts at the University of Ghana. She applied to pursue a master’s degree in Social Justice and Equity Studies (SJES) at Brock University, Canada. She has a great passion for issues of social justice. After her master’s degree, she felt the need to improve on her knowledge before she delves into her career as a scholar-activist and a leading researcher on gender and social policy. She is the only daughter of her parents. I was born in the mid-80s to a patrilineal family in Ghana, West-Africa. In patrilineal families, male children are valued as they continue the family name, legacy and inherit all property. Female children are expected to get married and start a family with their husbands. Once female children from a patrilineal lineage get married, they are no longer members of their fathers’ family. These women become part of their husbands’ family as well as the children begotten in the marriage. As correctly noted by Siegel (1996) “a wife, at the time of her marriage, exchanges the authority of her father for that of her husband” (p. 9). Social construction theory is the lens through which I discuss the gender discrimination in Ghana’s cultural practices. Social construction theory explores the norms of masculinity, femininity, and the roles allocated to women and men across different communities (Strebel et al., 2012). The use of social construction to explicate the complex relationship between men and women in Ghana is to shed light on the cultural factors that motivate the oppression of women; whether simple and submissive or sophisticated and assertive. My mother is the eldest of two daughters. My mother was also born to a patrilineal family in 1953. Within the patrilineal system, all children belong to their father’s family and trace their kinship ties through the male line. Male children preserve the family legacy by having children to continue the family name (Nukunya, 2003). Due to the prestige attached to male children, they inherit all properties (both fixed and moveable) according to local customs and practices (Siegel; 1996; Kutsoati & Morck, 2014). Besides patrilineal kinship ties, Ghanaians also use matrilineal lineage. Lineage systems are based on some form of blood relationship (La Ferrara, 2010). Nonetheless, the matrilineal system is not matriarchy (rule by women). The reason being the formal positions of authority are held by either brother’s or mother’s brothers (Siegel, 1996). Based on patrilineal rules, my mother received a minimum education. Her parents expected her to learn a trade and later find a husband to start a family. A woman’s status as a wife and mother attracts respect in the Ghanaian society. So, it is normal for parents to demand such expectations from their daughters. Some have argued that women born to matrilineal families tend to enjoy some privileges as the descent is traced through mothers (La Ferrara, 2010; Takyi & Gyimah, 2007). However, it is important to note that property and inheritance are largely the prerogatives of males in both patrilineal and matrilineal lineage systems. The rules of inheritance which is significant to improving an individual’s life chances are solely reserved for males. Based on the rules of succession, my mother did not receive any valuable property. Her only choice was to get married and start her family. My mother’s marriage story is an interesting one. I recall the many times she told me about how she met my father. One day, when she was returning from her regular sales job at the Ghana harbour, she was pursued by a young man. She decided to ignore this young man because it was culturally inappropriate for an unmarried woman to interact in public with a man. This young man followed my mother to know her place of residence. The next day when she went to work, the young man came to the house to inform my mother’s relatives of his intention to marry her. That was how my mother found a husband and got married a few weeks after. Before any marriage ceremony takes place in Ghana, the male suitor is given a list of items to provide for the hand of the bride he seeks. The list of items demanded by the bride’s family is called the bride-price (or bridewealth as known in other cultures). The payment of bride-price is a universal practice in Ghana (Dei, 2004). However, there are variations in the kinds of gift payments offered by the groom and his family. In most instances, the bride’s family accepts livestock (as practiced by ethnic groups in northern Ghana) or other moveable property (like African fabrics, drinks, beads, and money) as compensation for the loss of their daughter’s labour and fertility (Siegel, 1996). The significance of the bride-price is to legitimize the union. From the perspective of rational choice, the traditional obligation of the payment of bride-price hypothetically implies that women are considered part of the property of men (Takyi & Gyimah, 2007). Rational choice theory simply argues that rationality is the premise for most decisions or actions (Joas & Knöbl, 2009). Connecting this to marriage in the Ghanaian context, the exchange of resources between families in the form of bride-price payments gives men power over women. After my father had presented the bride-price to my mother’s family, their marriage was socially recognized. Without the payment of the bride-price, the legitimacy of the marriage and the children begotten from the union remain questionable under customary laws. Without knowing much about my father, my mother braced up and moved into her husband’s house. After learning about the events leading to my mother’s marriage, I could not imagine having to go through a similar experience. Growing up, my father was skeptical about investing in my education. Mainly because he felt, I will get married someday, and the returns in my education will benefit my husband’s family. Based on the phrase ‘experience is the best teacher’, my mother was a strong advocate for my education and intellectual welfare. Having lived through the bitter experience of not having the opportunity get educated because of the cultural ideology that a woman’s place is her husband’s home, my mother was convinced education would give me better opportunities in life. In contrast to my mother’s experiences, I was raised in a much liberal patrilineal home because my family lived in one of the major cities in Ghana. Being raised in the capital city made a difference in my life’s chances because the social structure functions in a hybrid cultural atmosphere. Meaning, people living in major cities in Ghana have liberal views because of the infiltration of western institutional processes and values. As a result, I had the opportunity to access quality education and extra tutoring at home. However, being the only daughter, I also had to help in the kitchen and engage in a variety of domestic chores because my mother insisted my education will not be complete without learning to be a subservient wife. My three brothers, on the other hand, had the freedom to engage in extracurricular activities with no household duties. When I complain about doing most of the domestic work, my parents would say my brothers are men, and someday their wives would serve them, so there was no need assigning them house chores. I could not help but be the odd one among my friends and colleagues. As a young woman studying at the University, I had ‘big’ dreams. Not dreams of being married with children by the age 25 but dreams of pursuing higher education. Dreams of becoming a powerful woman. Dreams of being independent and career oriented. Dreams of advocating for the cause of women. Dreams of building a legacy that women hardly aspire to achieve. These dreams contradicted and conflicted the gender expectations of my society. Most of my friends told me I would never be married because I had strong feminist views. Some said men would be afraid of me. The young men within my social circle called me ‘Margaret Thatcher.’ A connotation for ‘a strong-willed, male dominating woman.’ Others called me stubborn, controversial, aggressive, and arrogant. Although I could handle these criticisms because of my passion for being successful, this experience questioned my aspirations. In 2013, I was engaged to be married to a West African. My family was excited because I found a man that valued our culture and tradition. Personally, I felt relieved because I had been friends with my fiancé for seven years. I was convinced we both knew each other well enough to start the journey of marriage. However, our relationship changed when we started a courtship. My fiancé would constantly make all the decisions in the name of being the man. He went ahead to set the date of our traditional marriage ceremony and also proposed when it was appropriate for us to have our first child. Anytime I made suggestions contrary to his views; he would say I am not submissive. Our relationship took a rocky path when I mentioned the essence of having an educated woman for a wife, is to share ideas on how to manage our lives. Many of his friends suggested the need to reconsider his position on our marriage because I don’t look like the type of woman that can be controlled. The idea of not being able to take charge of our relationship became the breeding ground for fear and mistrust on the part of my fiancé. In one of our conversations, I stated I did not want to change my maiden name after marriage. I wanted to keep my father’s name in addition to my fiancé’s surname name. My fiancé replied saying “so long as I am going to your family to pay your bride-price, then you do not have the right to keep your father’s name.” In other words, the payment of my bride-price means I am a ‘sold property.’ This cultural mindset made me uncomfortable, and a few weeks later, our marriage plans were cancelled, and the relationship ended. I was disappointed in the turnout of events, but I did not feel obliged to get married when my value as an educated woman was devalued. I make reference to my experiences to emphasize what it means to be a dangerous woman in the West African context. A ‘dangerous woman’ is one that rises above the cultural roles assigned to gender through education. As an educated woman, I am a threat to the traditional rules of masculinity. The need for West African men to lead both in private and public becomes difficult if such men encounter educated women that have no desire to be controlled and dominated. The cultural expectations of gender as explicated through lineage systems, rules of inheritance and marriage denied my mother formal education and the sense of empowerment. My mother’s only choice was to get married a few weeks after meeting my father because she could not continue working as an unpaid sales girl for her aunt’s business. Undoubtedly, my mother had a tough life with no real options, but in reality, she is accorded the respect for honoring the expectations of womanhood. I, on the other hand, pose a threat to traditional hegemonic masculinity by being highly educated with the desire to be independent in all spheres. I am a ‘dangerous woman’ because I do not fit into the model for a woman as defined by traditional men. Joas, H., & Knöbl, W. (2009). Social theory: twenty introductory lectures. Cambridge University Press. Kutsoati, E., & Morck, R. (2014). Family ties, inheritance rights, and successful poverty alleviation: Evidence from Ghana. In African Successes: Human Capital, Volume 2. University of Chicago Press. La Ferrara, E. (2010). Family and kinship ties in development. Culture, Institutions, and Development: New Insights into an Old Debate, 84, 107. Siegel, B. (1996). African Family and Kinship. Anthropology Publications. Paper 3.